Are you on Santa's nice list this year? Of course you are! You have been good all year long, so enjoy these sinfully sweet copycat Christmas breakfast recipes. From homemade Cinnabon cinnamon rolls to doughnut pancakes, these breakfast recipes are the perfect treat to have on a cold and snowy Christmas morning. Your kids are going to forget all about their presents when they see a warm and delicious breakfast like these recipes waiting for them. 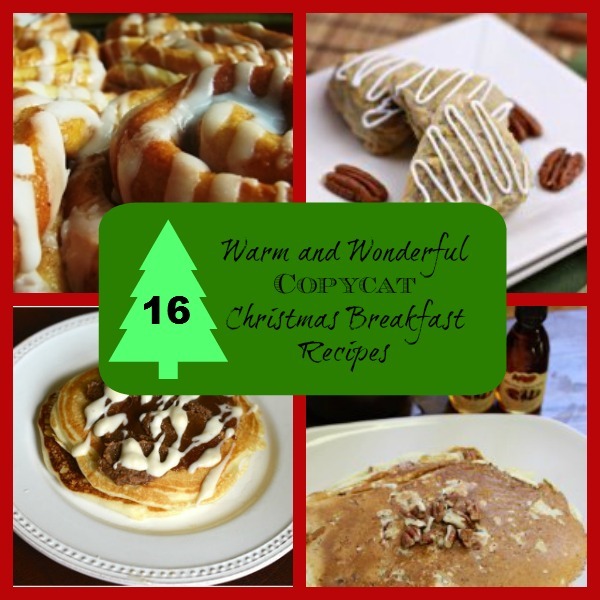 All they are going to want for Christmas are these 16 Warm and Wonderful Copycat Christmas Breakfast Recipes. 1) Cinnabon Cinnamon Rolls: There's nothing better than the sweet smell of cinnamon rolls wafting through the house. That smell is even better with these amazing copycat Cinnabon cinnamon rolls. 2) Gooey Cinnabon Cinnamon Rolls: You do not need to go to a cramped and overcrowded mall this holiday season to enjoy the ooey gooey goodness of Cinnabon cinnamon rolls. Make them at home instead with this warm and wonderful recipe. Still looking for great side dishes to make for Christmas dinner? Serve up one of these recipes from our printable collection: Holiday Side Dish Recipes: 10 Easy Side Dishes for Christmas! 3) Doughnut Pancakes with Doughnut Glaze Syrup: This amazing and rich breakfast combines two of the best breakfast meals around: doughnuts and pancakes! This is a treat that the whole family can enjoy. 4) Homemade IHOP Cinn-a-Stack Pancakes: This pancake recipe makes for a warm and cin-ful Christmas delight. 5) Copycat Cracker Barrel Pecan Pancakes: IHOP is a great inspiration to create great Christmas breakfast recipes and these Swedish pancakes are no exception. 6) Better than Buffet Pancake Dippers: Kids will forget about all the presents once you put these yummy creations out! 7) Better than Dunkin Banana Baked Donuts with Peanut Butter and Bacon: Everyone will forget about the presents Santa brought them after they have one bite of this Elvis-inspired treat. 8) Krispy Kreme Doughnuts: Grab a cold cup of milk and enjoy these donuts that are better than the real thing. 9) Copycat Tennessee Tea Cake Donuts: This doughnut recipe is perfect for an old-fashioned or Southern Christmas. Looking for Christmas cookie ideas? Try one of these 9 Christmas Cookie Recipes for Hosting a Christmas Cookie Exchange Party! 10) Copycat Starbucks Gingerbread Loaves: These gingerbread loaves are perfect for breakfast, dessert, and for a post-presents snack. 11) Copycat Starbucks Maple Nut Scones: Scones recipes make for marvelous Christmas breakfast recipes and these Maple Nut Scones taste exactly like the ones from the coffee shop! 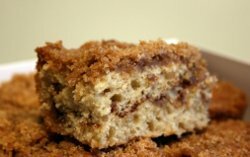 12) Copycat Starbucks Classic Coffee Cake (shown at top of page): There is no need to go over the hill and through the woods to enjoy this classic treat from Starbucks because you have this amazing recipe at your fingertips. 13) Starbucks Copycat Petite Vanilla Scones: Start a new holiday tradition by making these unbelievable scones every Christmas. 14) Copycat Cracker Barrel Ham and Egg Casserole: This casserole recipe is perfect for feeding a crowd. 15) Copycat Maple Cinnamon Pop Tarts (shown above): These warm and flaky treats are something everyone can enjoy. 16) Homemade Entenmann's Breakfast Cake: Bring cheer to all those who are near with this charming and delightful recipe. I CAN'T PRINT THIS RECIPIE HELP!